Full length, heavy-duty cutting board is included. Self closing doors that remain open at 90 degrees. Solid door construction with foamedin- place recessed handle. Interior cabinet is bright white ABS liner with full stainless steel floor with coved corners. Magnetic door gaskets are removable and replaceable without tools. 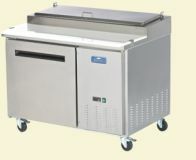 Easy to mount casters (two locking) are standard with all units.